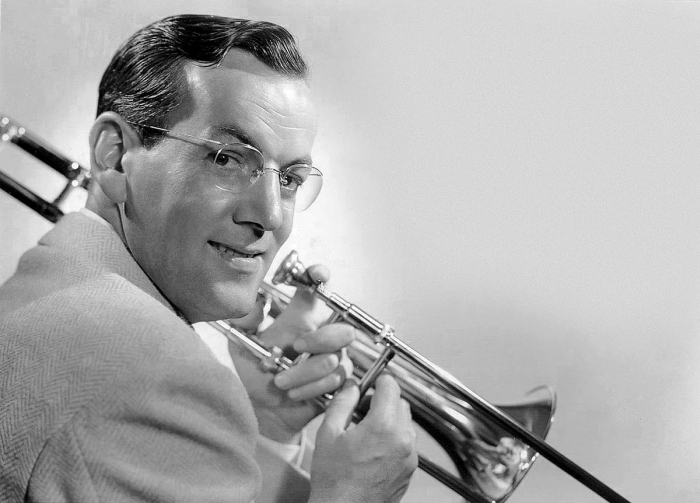 Fully one-fourth of the top hits sold or listened to by the majority of Americans in 1940 were performed by Glenn Miller. Music critics said that Miller “too commercial,” but the public wasn’t in the mood to listen to critics. [Editor: Pun intended – couldn’t help it!] Tunes like Tuxedo Junction and Pennsylvania 6-5000 were easy melodies to follow, easy melodies to dance to, and most of all, fun to listen to. Phones — albeit party lines — were ringing across post-depression America, and songs like 6-5000 struck a chord with listeners. The proof of Miller’s popularity rings true in the 21st century, over six decades later. In The Mood continues to be a favorite at dance parties, weddings…anywhere you find a DJ or a dance band with horns. The critically “important” music of 1940 — Gene Krupa, Woody Guthrie, Duke Ellington, and even Benny Goodman — is indeed still studied in college classes, but it won’t be played at a college dance. But Glenn Miller is still in attendance, more than 60 years after his untimely death. While Miller out-sold everyone else, the story of the year is probably the teaming of a skinny young vocalist with a top dance band. Singing for Artie Shaw for $75 a week was a slave wage for a burgeoning pop star, so Frank Sinatra jumped ship to the Tommy Dorsey Orchestra in January. Together they recorded some 40 songs during the next 12 months, the most successful of which was I’ll Never Smile Again which became one of the most important chart toppers of all time, spending almost three months at the number one spot. In the fall of ’40 Sinatra hit the silver screen in a forgettable flick called Las Vegas Nights. But again the public could care less what the critics said — “Bones” was a sensation. Frank crooned, and the bobby-soxers swooned. He quickly became too big for the Dorsey show, and historians tell us that the relationship between singer and leader was often tempestuous. Sinatra would sign with Columbia Records as a solo act in 1943. Second in importance to Miller’s In The Mood for 1940 was When You Wish Upon a Star by Cliff Edwards, aka Ukelele Ike, aka Jiminy Cricket. The Disney Studios had a huge hit with Pinnochio, and the soulful delivery of that ballad by Edwards was arguably the high point of the film. Either way, Wish Upon a Star became a cultural phenomenon, and won an Oscar for best song. Only problem for Edwards and Disney was that Glenn Miller put out a “cover” version, which actually outsold Edwards. But Jiminy Cricket is the version remembered. A quick look at this list then raises the question, why is Edwards ranked higher, since Miller outsold him? And why is it ranked higher than the Dorsey/Sinatra number that spent 12 weeks atop the charts? The charts presented here on PopularSong.org are derived from a combination of past charts and present day factors, such as lasting popularity of a song. In almost every case, longevity or current popularity is more of a factor than past popularity, which is why When You Wish Upon a Star is rated higher than I’ll Never Smile Again, even though the latter was a bigger seller in 1940. Songs do go up and down on these annual charts; often a Broadway revival or popular movie soundtrack will breathe new life into an old tune. As a result, these charts are reviewed by PopularSong.org staff every 6-8 months, or whenever new documentation is uncovered. The Glenn Miller story is almost as fascinating as his music, and the book PopularSong.org recommends is Chattanooga Choo Choo: The Life and Times of the World Famous Glenn Miller Orchestra by Richard Grudens. It tells the story in an informative manner that reads all too quickly, as the story and the writing is extremely compelling. Gruden describes the band’s meteoric rise, and paints a vivid picture of the times. He also deals with the mystery of Miller’s disappearance on December 15, 1944, but then goes on to describe the continuing saga of how the band has lived on in perpetuity. The link goes to Amazon.com.